Filtering is a technique for modifying or enhancing an image. For example, you can filter an image to emphasize certain features or remove other features. Image processing operations implemented with filtering include smoothing, sharpening, and edge enhancement. What Is Image Filtering in the Spatial Domain? In a spatially filtered image, the value of each output pixel is the weighted sum of neighboring input pixels. The weights are provided by a matrix called the convolution kernel or filter. This example shows how to filter an image with a 5-by-5 averaging filter containing equal weights. This example shows how to create a type of special filter called an unsharp masking filter, which makes edges and detail in an image appear sharper. When a portion of the convolution or correlation kernel extends past the edge of an image, you can extrapolate image values by zero-padding the image or by replicating boundary pixels. Noise refers to random error in pixel values acquired during image acquisition or transmission. Removing noise can improve image quality. This example shows how to blur an image using Gaussian smoothing filters of different strengths. The example includes isotropic and anisotropic Gaussian filtering. This example shows how to reduce noise associated with computing image gradients. What is Guided Image Filtering? Guided image filtering performs edge-preserving smoothing on an image. It uses the content of a second image, called a guidance image, to influence the filtering. This example shows how to reduce noise from an image while using a guidance image to preserve the sharpness of edges. This example shows how to segment a hot object from the background in a thermographic image. This example shows how to find the regions, and how to compute the region properties, of a binary image. You can sort the regions based on the properties. This example shows how to filter a binary image based on properties, such as area and perimeter, of objects in the image. 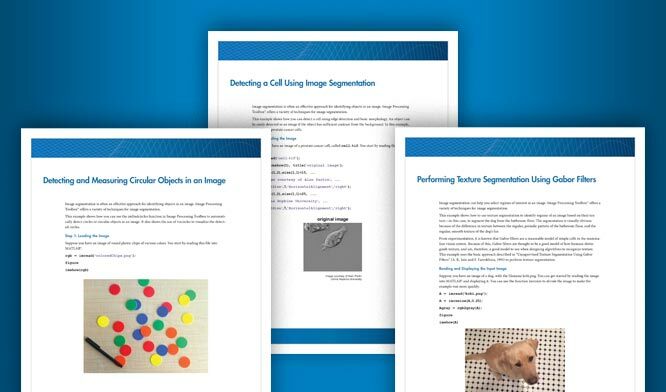 Integral images are a quick way to represent images for filtering. In an integral image, the value of each pixel is the summation of the pixels above and to the left of it. This example shows how to smooth an image by different amounts by applying box filters of varying sizes to the integral image. You can design filters that modify the frequency content of images. Filtering in the frequency domain is often faster than filtering in the spatial domain.